So, The Expanse is back and critics keep talking about how amazing it is while seemingly nobody is still watching it. “Fight or Flight”, the premiere, waved the possibility of all our little buddies getting together and heading to Io to save a little girl. Prax getting falsely accused by corrupt Earth government officials (who it is implied threatened his ex-wife into corroborating the story) of beating his ex-wife and molesting his daughter. Which I am still hoping they skip, given the moment we’re in. All in all, he show has finally found its groove. Probably just in time to be canceled due to low ratings. Here’s hoping they finish the entire third book in the back end of the season, because it would serve as a logical endpoint for the series. Its been gone a year, like most series. The actress playing Bobbie has really gotten into the grove of her character, last season she seemed more like a frightened child than a marine sergeant. The Razorback's exterior was exquisite. The inside is way too spacious for a space racecar. A tandem or side-by-side fighter-type cockpit (no windows, of course) may have made more sense. Yeah, but it's a Yacht, not an F1 Racer. I dont have the book at hand, but I seem to recall Julie won a Luna-to-somewhere circuit with it, so the layout is ok, and you'd want space to move around when not under hi-gee burn for eating, resting, normal people stuff. It really is pretty though, and almost half the size of the Roci too. Oh, sorry. I should have re-read your post. Mmm... a B-2 bomber crew can fly long-duration missions with much less space - it's still enough to heat meals, apparently. 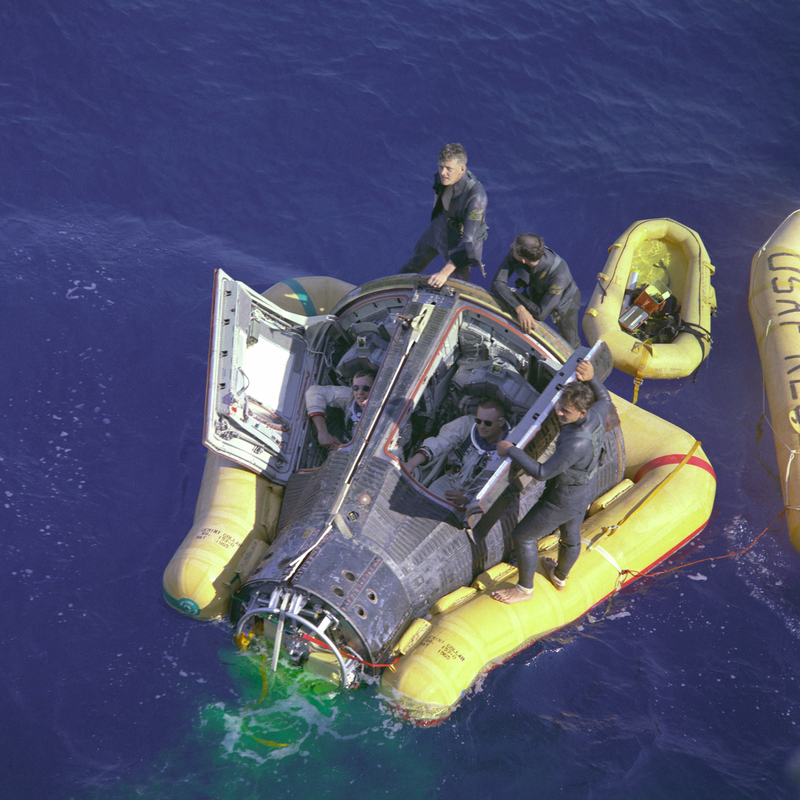 A better example: Gemini 7, a tiny, 2-seat capsule, flew for 14 days. Plus, a B-2 was originally intended for a larger crew, so the 2-man crew has a bit of room to move around, even have a nap, even if just on the deck with sleeping bag. Speaking of ratings, I just got into Amazon Prime and I thought it meant I get to watch for free, so I ain't paying $3 per episode to watch them. Gemini capsules were very compact and very economical spacecraft. A 14-day mission was flown in this (the service module - mostly machinery, with no pressurized volume - was jettisoned before reentry). Am I the only one thinking the series has fallen in quality in pretty much every department but most severely in acting? Seriously, 3 episodes in, and the meaty stuff coming , and you have complaints? Acting and direction seem subpar compared to earlier seasons. The spaciousness was because it used those gimballed crash couches. Without them, the 5-6g burns with brief 10+G turns would turn the occupants to soup. If you notice, the amount of space was just enough for both pods to flip completely around without touching. Huh? The acting has picked up, and the direction (especially of the space battles, has gotten better. I dunno, I’m no critic, and am an admitted super fan. So maybe I’m wearing rose colored glasses. But the actual critics have said nothing bad. Why would you need to bank (spacecraft are not aircraft)? Just use RCS thrusters to spin the spacecraft around (we saw them do it), point the engine in the right direction, and light. Acceleration remains in the same direction relative to occupants. No gimballed seats needed. Except that it is a racing ship that (according to the book authors who are EPs on the show) would mostly “race” by being able to accelerate and turn rapidly, while accelerating, and use gravity slingshots. If you turn while accelerating or rapidly turn due to a gravity slingshot, you will experience centripetal Gs. In the books, all the ships had gimbaled crash couches (with less range of motion than depicted for the razorback) for the purposes of being able to move evasively for just that reason. But if we’re going “hurr hurr spacecraft aren’t aircraft”, than why would the internal volume of the ship match that of an aircraft made for similar purposes? You can’t say “it should look like a racing aircraft might” then act like the valid reasons it doesn’t don’t make sense because “it isn’t an aircraft”. If the main engine is gimballed, gimballing the chairs may make sense. But using RCS seems far simpler, and has been demonstrated in-episode. During gravitational slingshots, the accelerations of crew and spacecraft should be exactly identical because they are both in the same gravitational field, which acts on all mass identically (i.e. the crew should experience freefall until they burn). Yes, you can do really cool stuff with atmospheres. Aerogravity assists (using an atmosphere to generate lift and do a 180 around a planet to put you into a retrograde orbit, check it out ) are really, really, awesome, and the sort of thing you might want to do. This is the only situation I can imagine that would exert centripetal forces on spacecraft (actually, it's acting as an aircraft now) but not crew. Yes, you might need a reclining chair for that. But probably not gimbals, although they might look cooler. For simple aerobraking/capture, the deceleration should be towards the rear of the spacecraft (assuming the pointy end goes into the atmosphere while the big engine bell is protected by the pointy end). Same couches are good. For leisurely, <1g burns, a sitting chair is better than a reclined chair for comfort; but at >1g, a reclined chair improves crew survival. Hence the reclining. That might justify a chair capable of 180 rotation (and explains the recliners).